Recently Petroteq has been creating press releases and has put out PAID SPONSORED articles on energy websites stating they can produce oil at $20 a barrel. With the price of oil above $45 for the second half of 2016 and averaging about $50 in 2017, why couldn’t they ramp up production of their low-cost $20 a barrel oil? The reason is simple… they can’t produce oil anywhere near $20 a barrel. In 2017 MCW energy changed names to Petroteq They have a lot to hide. See the complaint I made in 2016.
excerpts from this article explain the concerns well. I have seen first hand the fraud occurring on land leased from SITLA for tar sands and oil sands strip mining. “the more research I did on Petroteq and its competitors, the more I was convinced that the company’s claims were too good to be true due to old fashion EROI economics as well as several RED FLAGS. 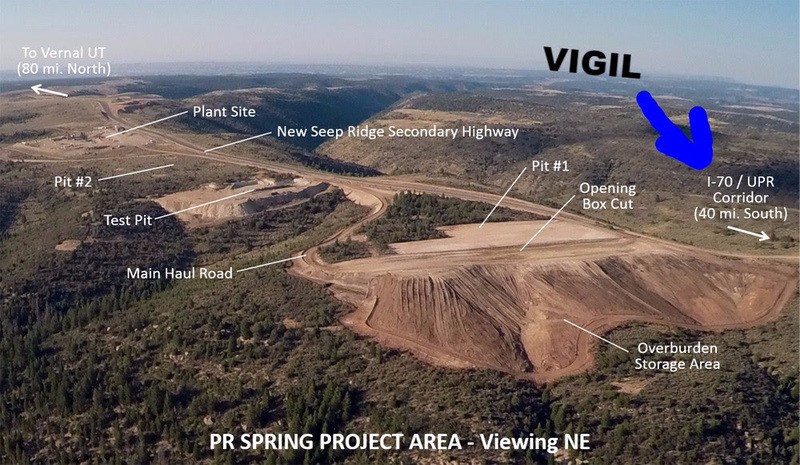 US Oil Sands PR Springs project sits idle. Daily observation shows a lot of nothing really happening at the PR Springs tar processing factory and the million dollar machines that are yet to actually work. The 99 acres including the beloved Children’s Legacy camp site are cleared of visible life and the tar layers are exposed even some “ore” has been collected and piled at the bottom of a giant conveyor belt that never moves. A few workers are on site. No longer needed is the 25 person bus from vernal that arrived every weekday last summer. 2 or 3 vehicles arrive on some days and work in the factory compound. No activity is happening at the mine pit. USOS has disclosed the lack of funds and inability to actually operate its process for 30 days as most recently promised and expects to operate for 5 days to show it can. But can it? USOS has been just about to produce oil since 2008. They have paid the corporate heads a lot of money over the years and spent a lot on the “factory” and mine but no oil has been produced. This is a victory for Earth! My research reveals a lucrative scam that has been enriching some and harming most for many years. There are key players and paid politicians who have been perpetuating the get rich pipe dream. The truth is tar sands or oil shale strip mining, upgrading into a use-able fuel and delivering to a viable market at a profit is a far off pipe dream in Eastern Utah. One can take a look at Canada and the reality of tar sands mining in Alberta to understand the amount of infrastructure and energy involved in the commercial production of oil. Literally billions of dollars were spent on the mines, factories and infrastructure to deliver the tar before ANY profit was returned on the investment. Even though policy makers in Utah have repeatedly claimed there is more oil here than in Saudi Arabia the reality is that the tar sands and oil shale are rocks and sand mixed with bitumen or kerogen, lacking the water molecules present in Athabasca tar sands and cannot be extracted the same way it has been done in Canada. Several attempts have been made and many false claims have been repeated by various start ups and even a few big oil names over the years yet none of these hopefuls have made any commercial product. On the other hand the history shows a poor regulatory effort including out right instructions in the record of how to avoid certain regulatory triggers and admitted failure to enforce clean up or “reclamation” policies, revolving doors from corporate to government and back, boom and bust cycles with real folks loosing their jobs and more plus real scum bags paying them selves big salaries for running these great scams. We continue to resist tar sands and oil shale development by exposing the scams. US Oil Sands announces they are near bankruptcy! US Oil Sands Idle factory site at PR Springs. News of the impending implosion of US Oil Sands. The 100 million dollar project is a big flop. This fact was actually quite clear for a very long time. Big money players have exploited the land and colluded with the politicians to create a cash cow for some, roller-coaster for others and big loss for the public. Not to mention nothing but a waste site of 99 acres that isn’t even as clean as beach sand as was promised, for the SITLA Trust fund beneficiaries. This company deserves to go under and every one will benefit from the end of this fraud. Now we must address SITLA and the state powers who are continuing to pursue tar sands. The Scam continues US Oil Sands gets more money. This is the 6th year of Utah Tar Sands Resistance opposition to the destructive mine plans of the Canadian Corporation, “US Oil Sands” or USOS. USOS has been leasing 50 square miles in the Book Cliffs from the State of Utah for tar sands strip mining since 2005. USOS claims they will produce oil this year, USOS has been claiming this every year, since 2008. Actually US Oil Sands has yet to produce oil commercially from their project in Utah. USOS has spent over 100 million dollars building the strip mine and tar processing facility at PR Springs. They have destroyed 100 acres of pristine forest and hold leases to 32,000 acres for tar sands strip mining. In the 4th quarter of 2016 they announced they were out of money and they laid off most of their employees. In January US Oil Sands obtained an additional 12 million dollars and is again claiming they will produce oil early in 2017. Our research shows that the Utah department of oil gas and mining (UDOGM) re-assessed the amount of the reclamation surety bond (Likely from our complaints) from approx $376,000.000 to $728,000.00 and they received and extension to pay this bond by February 15th. Which they did pay on Feb 14th according to UDOGM. We support Standing Rock and all resistance to DAPL! Utah Tar Sands Resistance shares the joy with the the Earth and inhabitants of Main and PR Canyons of a halt to the incomplete tar sands processing plant and strip mine at PR Springs. The history of this project shows that they have been promising to begin producing oil nearly every year since 2008. The reality shows that they are exploiting the land, the people and the future. The cost of this project is so far from profitable. The public needs to know that the decision makers in Utah are selling them and the school trust lands out. The so called “Green River formation” must be left in the ground, our air, light and water sheds preserved. As US Oil Sands continues to raise money and promises (again) to begin producing oil in 2017 UTSR is building awareness and resistance to stripmines and pipelines everywhere. UTSR will be resuming our public protest vigil in Spring 2017. We will host the 5th annual Intergenerational campout in June. Please consider giving a year end tax deductible donation to UTSR to support our campaign. The Protest Must Go On! In an effort to keep up the fight and our spirits we put up more banners. He does I listen (LOL) we are not actually trespassing. We gather up wood, make a big fire and enjoy an amazing sunset across the stripped land. Another unmarked police vehicle drives by from the Uintah county side and takes more pics with a long lens. He turns around after awhile and comes back towards us he swerves and covers his face to avoid being photographed by us. No one ever shows up from Grand County. We make sure to stay up late and flash our lights on the mine pit so the Uintah co cops have something to do. They keep watch till well after dark. On Sunday morning , a bike ride over to the Pig Pen ( a fenced in trailer for the cops to sleep in, Uintah county built onto the side of the US Oil Sands tar processing plant fence line), reveals that the Uintah Cops have gone home to Vernal. The new banner and protest camp can be seen from Seep Ridge Road and many folks drive by who are here hunting and recreating in this remote wilderness. Many tears have been shed over the loss of Children’s Legacy Camp and its thriving ecosystem. We will continue to witness and grieve for every leaf of every tree, every single fly, spider, mouse and bear and everything in between we will speak of them, and think of them and honor them, as the precious beings that we know they are. Our banners and protest continue to exist. Seepridge Road, Uintah County, UT – Ten participants of Utah Tar Sands Resistance’s 4th annual family camp out on the Tavaputs Plateau have been arrested after completing biodiversity studies close to the country’s first tar sands strip-mine. A group of children and adults walked to the wooded area next to the Children’s Legacy camp site to count plants and identify different species, in an area that several members of the group had camped at freely in previous years. Upon returning to their vehicles they were met by Ronald Barton, Special Agent for the Utah Attorney General’s office who told everyone they could not leave stating he was detaining the group for trespassing on state trust lands. and even threatened parents with reckless child endangerment. He also instructed a news reporter who had wanted to follow the group that she would be arrested if she attempted to do so. Near Children’s Legacy camp site, a Canadian company, US Oil Sands is hoping to extract tar sands. They are leasing SITLA land (which is public land).